Composing a professional writing bio for a cover letter or query letter is difficult, whether you’re a new writer with no publication credits, a mid-level writer with significant publications, or a professional writer. Literary agents look to author bios to ascertain whether writers are dedicated craftspeople or well-intentioned amateurs. Editors look to a writer’s publication history to support a tough decision to fill tight page space, or to include in the contributor’s notes. The author bio in your cover or query letter should be good—and while this article stresses the importance of having strong publication credits, it’s not unheard of that a writer with no experience (and a weak author bio) will gain national attention. Just be sure that the author bio in your query or cover letter is professional, succinct, and helpful to literary agents and editors of literary journals. DO keep it short. 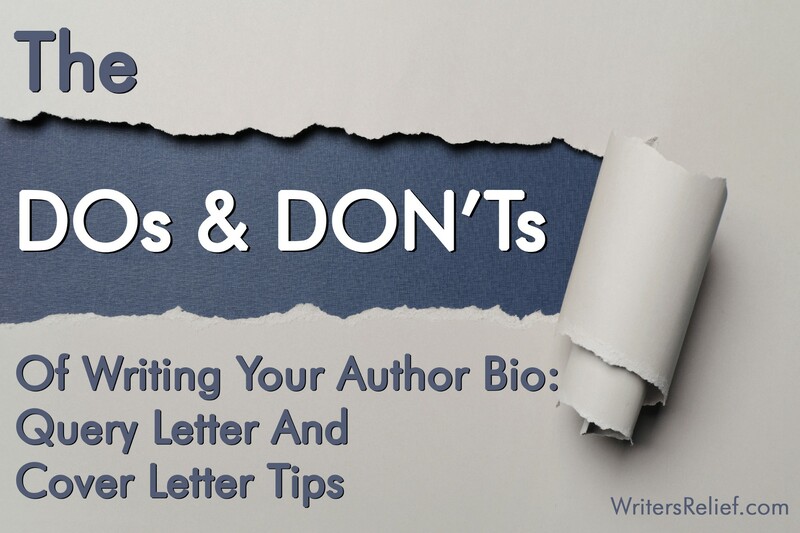 Your professional writing bio should be no more than one paragraph—two at the most. DON’T attach your resume, CV, or other professional documents unless they are specifically requested. Editors and literary agents won’t read them; they might skim them (if you’re lucky). And if you don’t prominently emphasize what is most important in your author bio, your best publishing credits may be overlooked. Your cover letter bio (or your query letter bio) is enough for most professionals. DO put your best writing credits first, where they’ll get noticed. DON’T include publishing credits that will peg you as an amateur, like disreputable poetry contests or shady Who’s Who listings. DO stick to the facts. Don’t overinflate or falsify. Don’t get gooey and sentimental about your past successes. DO list your self-published book projects, especially if you’ve received noteworthy accolades or had strong sales. DO list any books you’ve worked on, including the publisher and the date of the release. Example: The Book I Wrote (AnyName Publishers, 2010). DON’T say that you’ve been writing since you were six years old—or anything like that. DON’T say things like, “It’s my dream to be a writer,” or “I’ve been writing since I was five.” Ask yourself: Of everyone who is submitting, who doesn’t want to be a writer? Also, everyone learns to write at about age five. DO include personal information if it’s appropriate to your submission or if it might set you apart. How much personal information you put in your author bio is a personal choice. Your cover letter bio or query letter bio should reflect who you are in a professional manner. DO be consistent. You can write your bio in first person or third (though first is more common). Whichever you choose, stick with it. DON’T choose fonts that are annoying. At some point, every writer has NO publishing credits at all. Don’t panic; editors and literary agents know that everyone has to start somewhere—even you. Here are some things you might consider listing in your cover or query letter if you want to build up your writing credentials quickly. But as stated above, don’t fake it. If you really have no credits at all, don’t fudge. You may want to say a few words about yourself to indicate that you are dedicated and serious. We’re not talking about lip service. Editors and agents want proof, such as involvement in literary organizations, that demonstrates your commitment. Writer’s Relief composes effective, professional cover and query letters on behalf of our clients. For more information on how we can help you with making targeted, results-oriented submissions, learn more about Writer’s Relief author’s services. ← Is It Worth Your Time To Write A Memoir? Including this information in a sentence of your cover letter is fine. It shows that you know how to tell a good story, and will give your letter a little unique personality. I have published quite a few short pieces, both in magazines and in books, so I plan to list them in my bio. But I am also a storyteller who performs around the Midwest. I started an International Storytelling Festival in San Miguel de Allende, Mexico which is now in its fifth year. Will it appeal to agents that I am a storyteller or should I omit this? Some of my performances are available on UTUBE. Thanks Writersrelief.com for the advice on writing author’s bio, cover letter. The writer’s wish is to impress someone who will notice their work and read it. This advice should help writers out. Hopefully your advice will help me to write my next book soon.